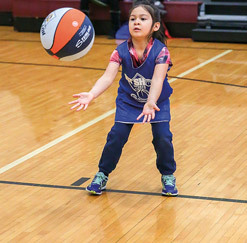 The Des Plaines Park District Youth Basketball League welcomes and encourages people from the community to volunteer as coaches. The basketball league begins in November and ends in February, and serves boys and girls in grades 3–6. All levels of coaches are eligible, whether you’re a beginner, experienced, or certified coach. Clinics are available for all coaches. Please note: Background checks are required for all coaches. We look forward to working with you to provide a safe, fun basketball experience for the youth of our community! To become a volunteer basketball coach, please fill out the application form and return it to Joshua Cantres, Athletic Supervisor, at jc@dpparks.org.